How to recover deleted pictures/photos from SD card, PC, Android and iPhone? Position : Tips - How to recover deleted pictures/photos from SD card, PC, Android and iPhone? Accidentally deleted pictures or images from camera memory card, computer, flash drive, smartphone, iPhone or anywhere else? Don't worry. This article provides solutions to recover deleted photos, images, pictures and other data from SD card, PC hard drive, Android device and iPhones. What you may not know is that in many cases you can undelete photos and pictures from various storage media. Scroll down and let's have a look how to get back deleted pictures. Guide 1: How to recover deleted pictures from SD card free? Guide 2: How to retrieve deleted photos from computer hard drive? Guide 3: How to recover deleted pictures from Android devices? Guide 4: How to retrieve deleted images/photos from iPhone? Have you ever accidentally deleted digital photos or images from computer, SD card, Smartphones or other devices? This can be a problematic situation if deleted photos happen to be your previous family images which haven't been backed up. Photos load great deal of importance, as it is able to record file stories and important moments. Memory fades as time goes on, and yet we can recall past time from photos. Fortunately, deleted photos are not immediately erased from storage media, and it is possible to get some or even all lost photos back before they are overwritten. Nowadays people would like to take photos using digital camera, Android phones, iPhones, etc. Photos are stored on these devices temporarily before they are backed up to computer or online storage. Thus, users may encounter photo loss issue on all these devices. Windows tries to protect data against accidental deletion by providing Recycle Bin where deleted files will be stored for a while and users can restore them. However, portable devices like USB flash drive, SD card, smartphones, memory stick, etc. do not have a Recycle Bin. If deleted files have a backup, they can be easily restored from backup copies. What if photos you just deleted haven't been backed up? You have no Recycle Bin to restore them. Do you know other methods to undelete photos or pictures from various digital devices? Don't freak out even though you have no idea how to undelete files. Take a deep breath and follow guides in this page to get back deleted photos or pictures from memory card, computer hard disk, Android phones as well as iOS devices. SD card is one of the most commonly used memory card and it is widely used on all kinds of digital products such as digital camera, smartphone, GPS Navigation, e-Book reader, mpp4, video recorders, etc. It can be used to store various files for example, pictures, videos, documents, apps, emails and so one. However, no matter what the file type, it may get lost due to deletion, formatting, SD card corruption, virus attack, etc. Recovering deleted pictures from SD card is one of the frequently asked questions and this section will show you how to recover deleted files SD card. Some users may feel confused that why deleted photos can be retrieved since there is not Recycle Bin for SD card. When you store a file on storage device like SD card, the file is stored on two parts: file content and pointer. The pointer is responsible for telling system where the file is stored. When you delete the file, only the pointer is removed without erasing file content immediately. Therefore, you have good chance to undelete the file before it gets damaged. In this section, we'll use free photos recovery software to restore deleted photos, images and pictures. Note: Do NOT do anything to the SD card once you realize photo loss issue. Do NOT take any photos or view existing photos on the memory card. Turn off your digital camera or cellphone which holds the SD card, and take it out immediately. Step 1 Connect the SD card to your computer via a card reader, making sure it can be recognized by Windows. If the SD card is not showing up in Windows, you should try a different USB port or card reader. 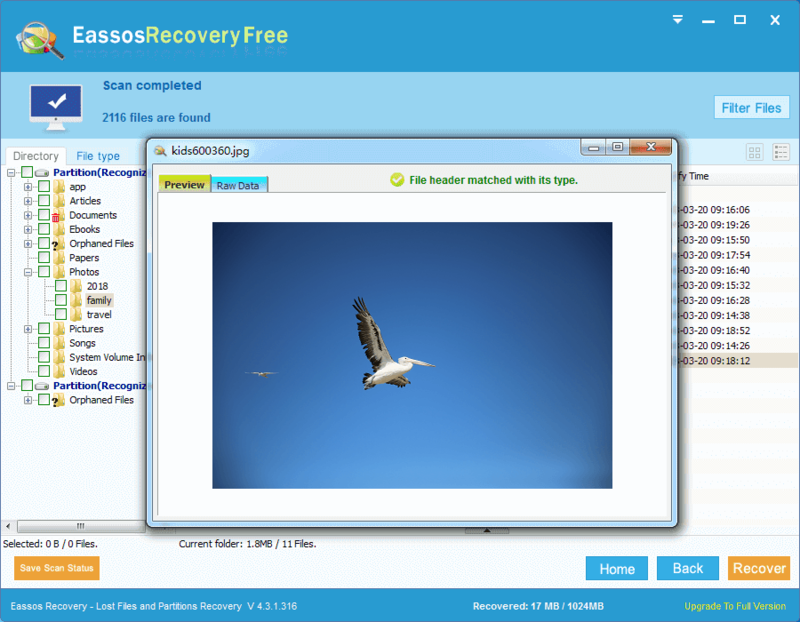 Step 2 Download and install free photos recovery software – Eassos Recovery Free on your computer. Note: do not install the program to the SD card. 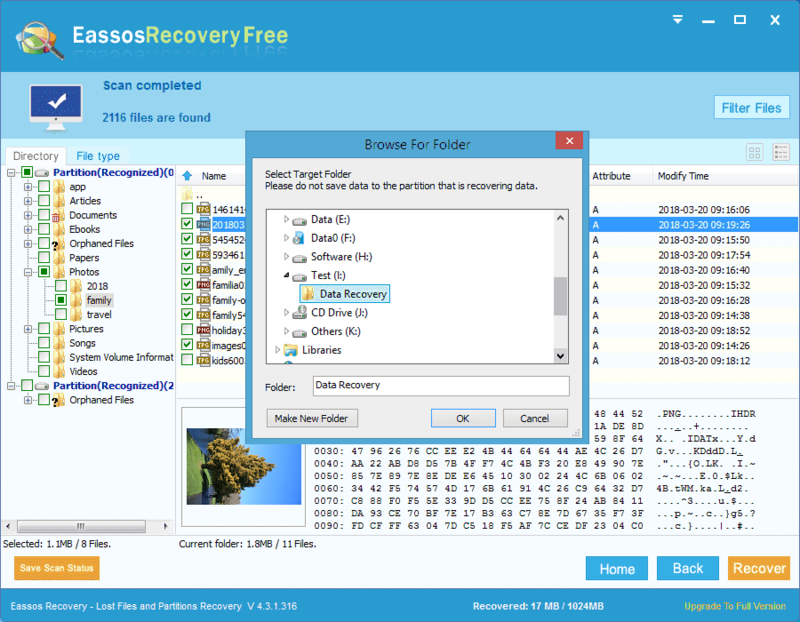 Eassos Recovery Free is powerful and safe data recovery software which works well on deleted photo recovery. It supports recovery of lost photos from HDD, SD card, USB flash drive, memory stick, external hard drive and so forth. 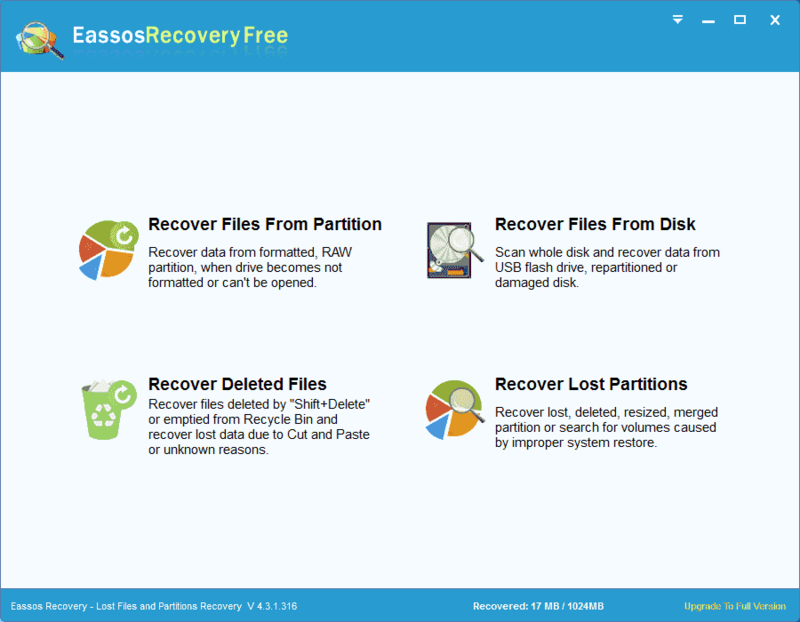 The recovery process is simple and beginning users can follow the onscreen instruction to undelete data safely and quickly. 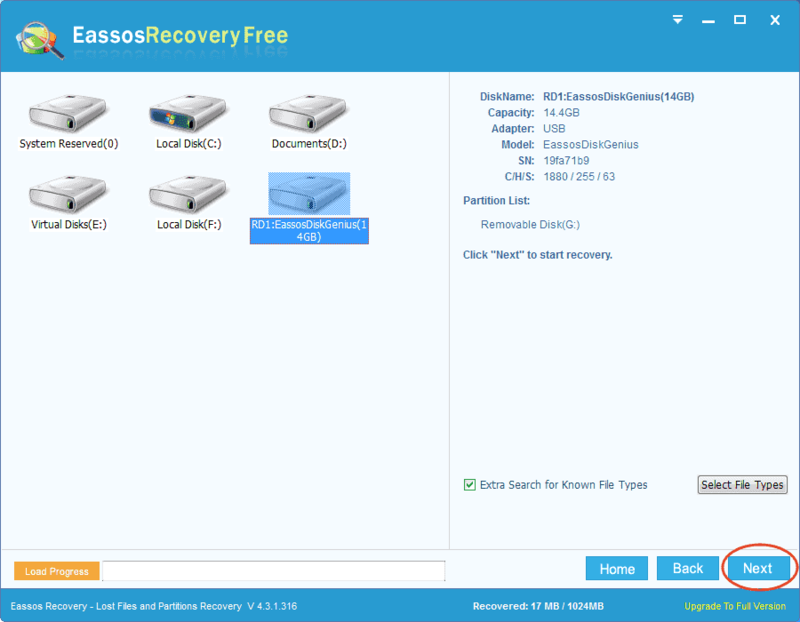 Step 3 Launch Eassos data recovery software and select recovery mode from the main interface. To retrieve deleted photos or images, you should choose "Recover Deleted Files" option. Step 4 Select the SD card where deleted pictured were stored before deletion and click Next to search for lost files. Step 5 Preview recoverable files after scanning and you can find out what you want to recover. Click a file and you can preview the thumbnail and binary data in the lower part; double-click a file and you can open the preview window which shows file content in its original size. Step 6 Choose files you want to recover and click Recover button. Then you can save files on a different drive. Method 1: Look in Recycle Bin to retrieve deleted photos. Never forget checking the Recycle Bin when you want to restore deleted data. If you just press Delete or drag file into Recycle Bin without emptying it, you can easily restore them to their original location. Double-click the Recycle Bin icon from desktop and open it: then check for lost photos and other files there; select files and folders you want to restore and right-click on them to choose Restore option from the menu. All these actions will restore your files to the location where they were stored before deletion. If you have the habit of backing up files, you can try your luck in backups. It's possible that those backup files contain deleted photos which makes recovering data very efficient and quick. Check your backup copies and try to find files you need. 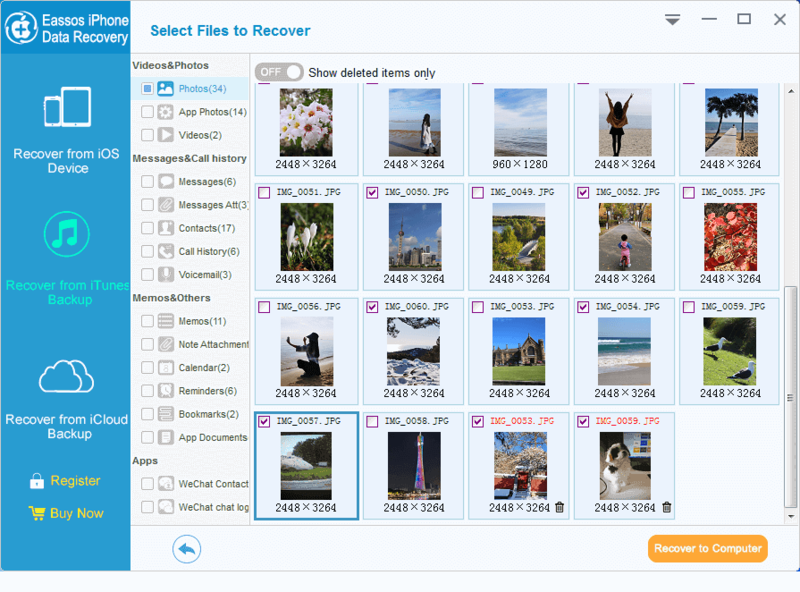 If you've never backed up files, what you can try is photo recovery software which can help you get back deleted or lost files. When it comes to undeleting photos from PC, hard drive or other storage devices, a profession recovery program should be chosen first. When you choose photo recovery software for PC, you should take five respects into consideration, i.e. security, quality, usability, compatibility and technical support. Here we recommend PartitionGuru Pro to undelete files from your PC or local hard drive. PartitionGuru Pro is one of the most recommended partition manager as well as data recovery software. It is capable of recovering lost or deleted photos along with other file types from HDD, PC, external HDD, flash drive, memory card, virtual disk, RAID, etc. The advanced scanning engine makes sure you can recover as many files as possible. It is compatible with all versions of Windows and supports file recovery from FAT, exFAT, NTFS, Ext2, Ext3 and Ext4 partitions. Step 1 Install and launch PartitionGuru Pro from Windows PC. Select the location where you want to recover deleted picture and click Recover Lost Files from Tools menu. Step 2 Select recovery options and click Start button to search for lost files from selected location. Step 3 Preview recoverable files listed in scanning result. You can find out file you need and check if the file is damaged or not via file preview. The follow screenshot shows the program is previewing a jpg file. Step 4 Select all files you want to recover, and right-click on them to select "Copy To" option. Then you can set a desired location to save these files safely. Some Android smartphones store data on two parts: memory card and internal storage. No matter how you store files, they still get lost due to all kinds of reasons. This guide will explain how to get back deleted photos and images from Android devices's memory card and internal storage. 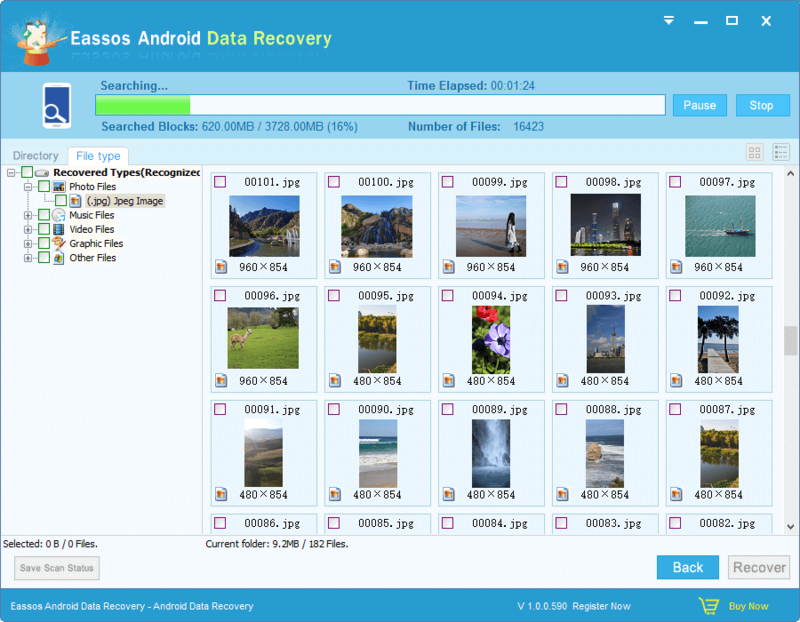 Many users may wonder whether it is possible to recover deleted photos from Android phones. Although there is not a Recycle Bin on the device, it does not mean deleted pictures are erased permanently after deletion. Android data recovery software is able to scan either SD card or internal storage space to restore lost data for you. What you should do to guarantee satisfying recovery result is avoiding data overwriting. Thus you should stop using your Android phone at once and do not save any data to it. Note: The recovery process requires root privileges on your phone. 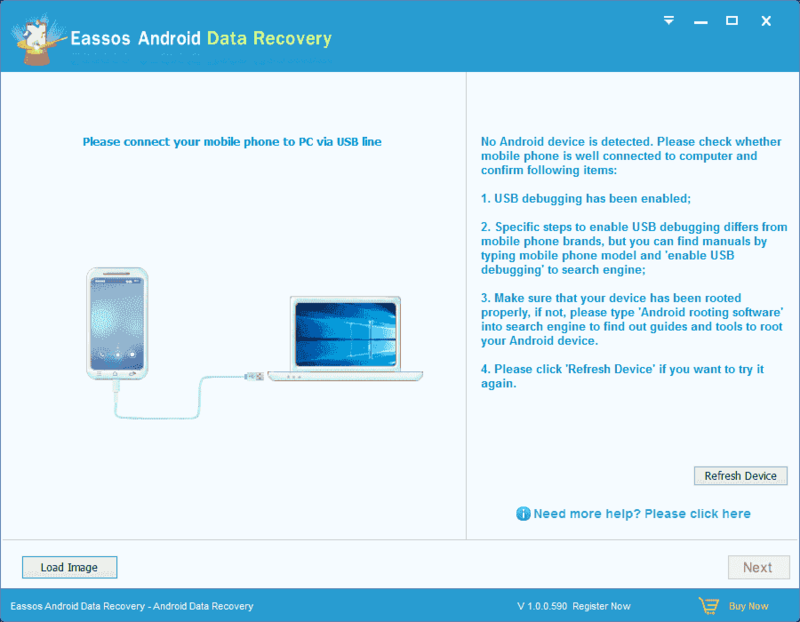 Step 1 Download Android Data Recovery software and install is to your Windows computer. Then connect your Android phone to the PC via USB cable as well. Step 2 Click Refresh Device button to load storage space on the Android phone. Step 3 Select location where lost pictures were stored before deletion and click Next button. If your phone contains an SD card, you should make sure where lost files were stored before they got lost. If you select wrong location, the software cannot find out correct files for you. Step 4 Preview and selectively recover files. You can preview recoverable data during scanning and check if files are correct. Tick in boxes next to photos you want to recover and click Recover button to save files to computer hard disk. The tutorial talked about in this section can be used to recover deleted images, pictures, photos, contact, message, call history, notes, etc. from all kinds of iOS devices, including new iPhone X/iPhone 8/iPhone 8 Plus and iOS 11. To restore lost data from iOS device, you need to install iPhone data recovery tool on your computer in the first place. 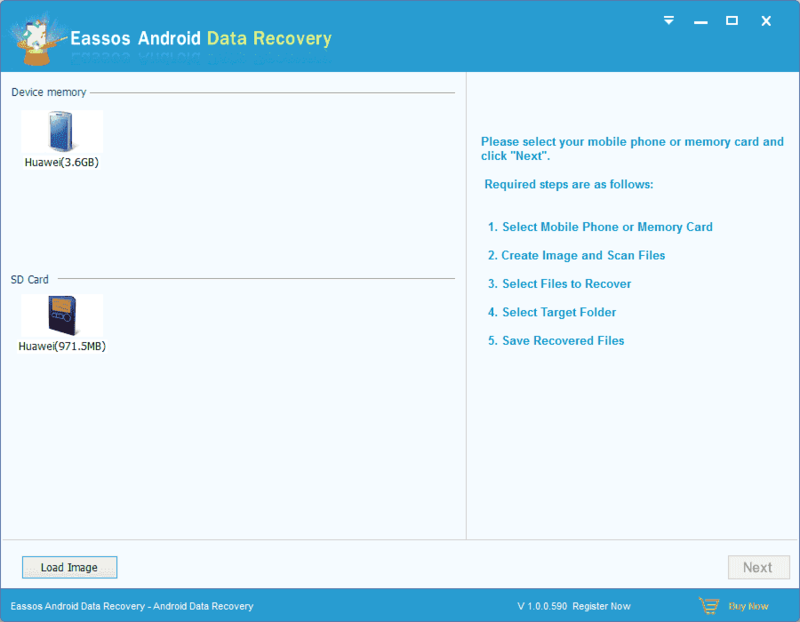 Here we use Eassos iPhone Data Recovery software as an example to explain the recovery process. Step 1 Connect you iOS device to your computer. Plug a USB cable into the USB port of your PC and connect the other end with your iOS device. Step 2 Launch the iOS data recovery software and you can see 3 recovery modes. Click on the mode "Recover from iOS Device" and click Start Scan button. 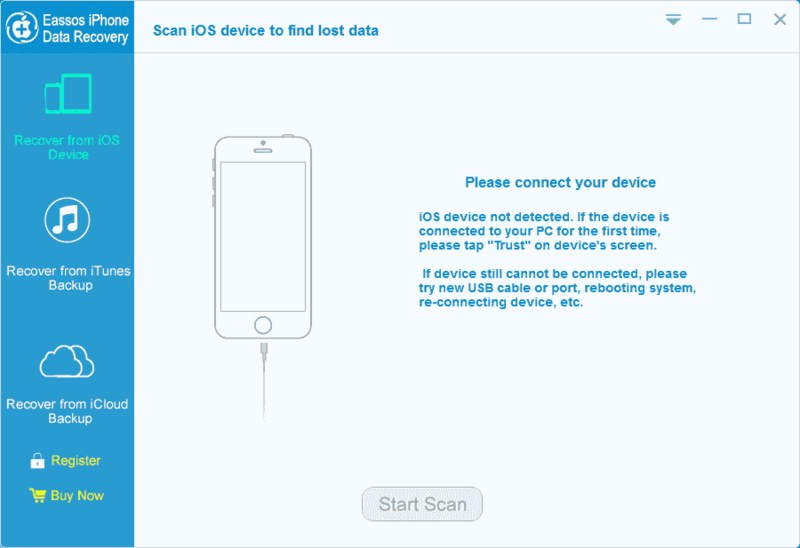 Step 3 Scan your iPhone device for lost data and preview recoverable files. Once you click on Start Scan button, the program starts to analyze the device being scanned and list recoverable files. You can preview listed files to locate what you want to recover. Step 4 Recover photos from the iOS device. Select photos or other files you want to restore and click "Recover to Computer" button. Then you can set a location on your PC and save these files. Note: Do not recover files to the device directly, or lost files will be destroyed by writing actions. This article introduces 4 guides to recover deleted pictures, images and photos, which can be used to undelete files from SD card, computer, hard drive, Android phones, and iOS devices. We hope these instructions mentioned above have helped you get back lost photos. Although these recovery processes are every simple to follow, it is really important to note that you should always back up data to avoid data loss issue. If you found this tutorial useful, please do not forget to share it.